The remarkable new book shatters just about every myth surrounding American government, the Constitution and the Founders, and offers the clearest warning about the alarming rise of one-man rule in the age of Obama. 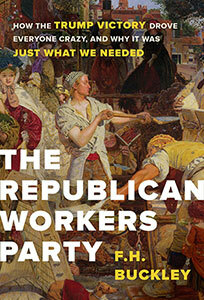 Buckley’s new book debunks all these myths. America isn’t the freest country around, according to think tanks that study these things. And it’s not the Constitution that made it free, since parliamentary regimes are generally freer than presidential ones. Finally, what we think of as the Constitution, with its separation of powers, was not what the Founders had in mind. What they expected was a country in which Congress would dominate the government and in which the president would play a much smaller role. Sadly, that’s not the government we have today. What we have instead is what Buckley calls Crown government, the rule of an all-powerful president. The country began in a revolt against one King, and today we see the dawn of a new kind of monarchy. What we have is what one of the Founders, George Mason, called an “elective monarchy,” which he thought was worse than the real thing. Much of this is irreversible. Constitutional amendments to redress the balance of power are extremely unlikely, and most Americans seem to have accepted and even welcomed Crown government. 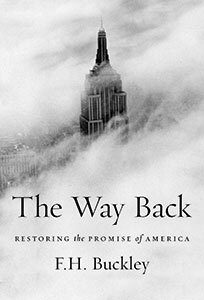 The way back lies through Congress, and Buckley suggests feasible reforms that it might adopt to regain the authority and respect that it has squandered. No U.S. political scientist has achieved what F.H. Buckley … does in this ambitious book. The best recent description of [the modern presidency]… A very important contribution. This thoroughly researched book provides an interesting comparative look at the rise of the administrative state in a number of countries and may prove useful for scholars and legislators alike. Essential reading … Buckley is the rare scholar who can write engagingly for a popular audience. The Once and Future King is a worthy contribution to the great discourse on liberty and power which has existed and will continue to exist between the great nations on opposite sides of the Atlantic. Rises above the partisan bickering in contemporary Washington and shows that this is a systemic problem. A penetrating analysis of the dangerous growth of executive power. Just when you think there’s nothing more to be said about the Constitution’s framers, F.H. 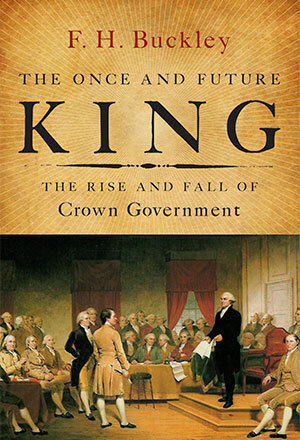 Buckley’s provocative The Once and Future King: The Rise of Crown Government in America (Encounter, 2014) comes along. Read Once and Future King to see the true scope of the problem of executive power, not for easy answers. The Once and Future King deals with constitutional issues at a more serious level than almost anything else I have read recently. Th e prose, moreover, is elegant and flowing. It is an easy read, even though it deals with serious and complex problems. This is a beautifully written, very interesting, and largely persuasive book. The book is immensely enjoyable to read and to think about. 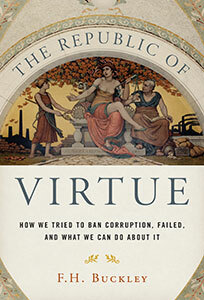 It is written with real brio and strongly articulates a distinct point of view—i.e., the superiority of parliamentary government—that most American readers (and students) will find nearly bizarre, given socialization into standard verities about the wonders of the American way of doing things. It’s a bracing read, in every way. This is a bold and willfully provocative critique of American presidential power, how and why it got to be that way, and what we can do to change it. Buckley takes no prisoners in his trip back to the American founding, with forays into the British and Canadian political systems, questioning all the conventional pieties and received wisdom along the way. If history truly is an argument without end, this is a new entry in the debate. Unchecked executive government—which F. H. Buckley, with characteristic wit, calls “Crown government”—has triumphed in the North Atlantic democracies, to the extend of threatening democracy itself. Buckley examines this profound development through the lens of American (and British and Canadian) constitutional history, to stunning effect. His brief for Congressional revival is utterly unlike the recurrent, schematic proposals for a U.S. parliamentary system. The Once and Future King is a work of virtuoso scholarship—bold, iconoclastic, and practical-minded in the spirit of the Framers themselves. You are revolutionizing Canadian political history and Canadian political science. The president has slipped off many of the constraints of the separation of powers. He makes and unmakes laws without the consent of Congress, spends trillions of government dollars, and the greatest of decisions, whether to commit his country to war, is made by him alone. His ability to reward friends and punish enemies exceeds anything seen in the past. He is rex quondam, rex futurus—the once and future king. And all of this is irreversible. He who knows only his own country knows little enough of that. People today might support the separation of powers for a variety of reasons, but fidelity to the intentions of the Framers isn’t one of them. In the end, the democrats won the day. The rickety machinery they devised for the election of presidents was a sealed car speeding through the first decades of the republic, darkened in obscurity on departure but emerging in sunlight on arrival to transform American politics. If [Madison] was the Father of the Constitution, … this was one of those cases, not unknown in delivery rooms, where the child bore little resemblance to the father. On occasion, [the Second British Empire] appeared to act on the principle that any feather-brained member of the upper class who looked good on a mount would make a good colonial ruler. Presidential lawmaking … amounts to a return to the monarchical prerogative powers that Roger Sherman and the other Framers so feared. A presidential government that can readily go to war is a government more likely to go to war, and a government with a greater military budget. The Court has abdicated its role as the policeman of the balance of power. It has ignored the rise of the executive branch and become the enabler of Crown government. It is like an umpire who yearns to award a 15-yard penalty against the hapless team that is down 49-0 at the half. America is one of the freest countries in the world [but] it wasn’t the presidential system that made the difference. What makes America exceptional is that for more than 200 years it has remained free while yet presidential. The charismatic leader cannot brook rivals. There can only be The One. Every other source of authority is suspect, both people and institutions. His charisma trumps them all. Chekhov said that, when the audience sees a loaded pistol on the wall in Act I, it must go off by Act III. The potential for political misuse in federal criminal law is a loaded pistol, and the mystery is why it hasn’t gone off yet. Congress should impeach and remove presidents often. When their policies fail, when they are touched with scandal, or for no reason, just for the spirit of the thing.